Villanova wins the NCAA Championship! One good shot deserved another. Kris Jenkins of Villanova wasn't about to be outdone. Jenkins overcame the shock of watching North Carolina's Marcus Paige hit a double-clutch 3 to tie it by spotting up behind the right side of the arc and draining a 3 of his own at the buzzer to lift Villanova to a 77-74 victory and the national championship Monday night. What a shot! What a game! 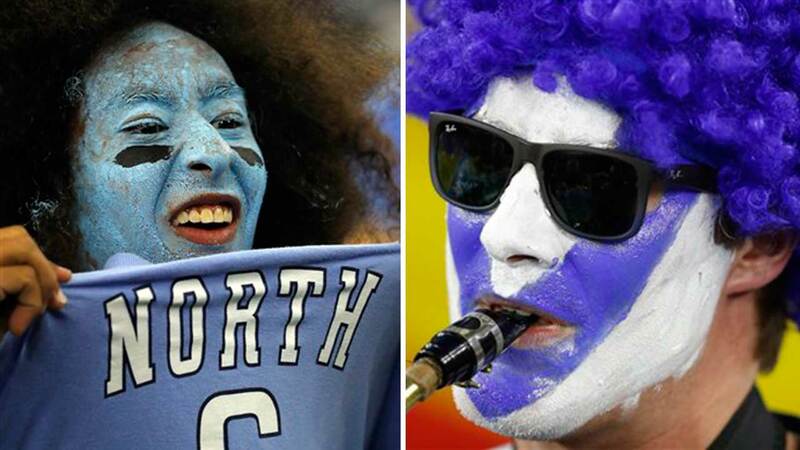 Villanova Wildcats battle the North Carolina Tar Heels in the National Championship game. The second-seeded Wildcats (35-5) had a six-point lead with 1:52 left, but watched it slowly trickle away. Then, it was gone. Paige collected the ball and jumped to take the shot. With Ryan Arcidiacono running at him, Paige double clutched and pumped one from beyond the arc to tie the game at 74 with 4.7 seconds left. After a timeout, Arcidiacono took the inbound pass from Jenkins, worked the ball upcourt and got it back to the junior guard. Jenkins took two quick stutter steps and, with daylight between himself and the defender, swished it from about two paces behind the 3-point line. 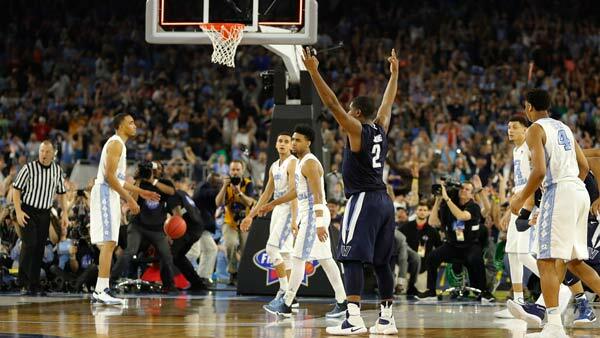 Hear the call of Kris Jenkins' winning buzzer-beater from Villanova radio. "Kris told him he was going to be open, Arch made the perfect pass," Villanova coach Jay Wright explained. "Kris lives for that moment." Jenkins' range is anywhere in the gym, as he showed earlier in the tournament by nonchalantly draining a shot from the edge of the midcourt logo. When this one went up, he never had a doubt. 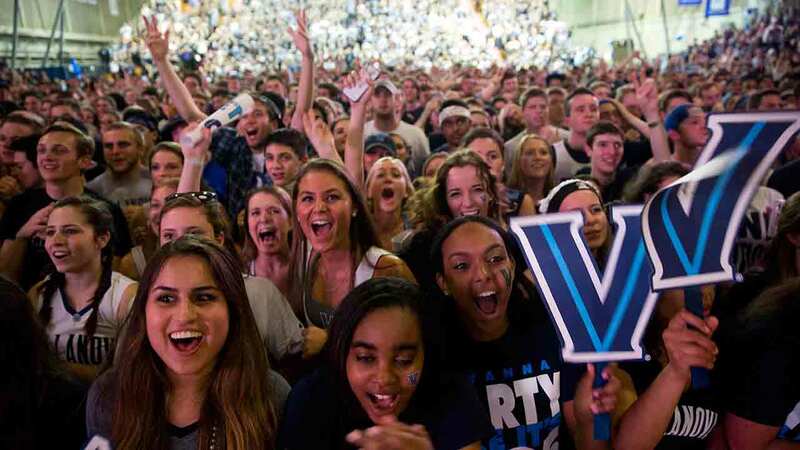 Nova Nation fans celebrate after Villanova defeats North Carolina to become national champions. "I think every shot's going in," he said, "and this one was no different." He finished with 14 points - the last three as memorable as any that have been scored in the history of this tournament. After being thrown to the floor by his teammates, he got up, leaped over press row, hugged his birth mom - a college basketball coach who helped him hone his shot - and shouted, "They said we couldn't, they said we couldn't, they said we couldn't." 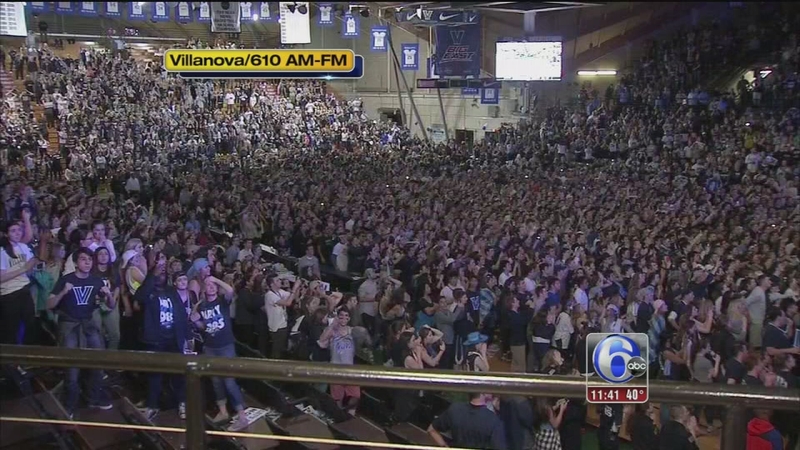 Nova Nation watched the NCAA Championship matchup between Villanova and North Carolina Saturday night at The Pavilion. This adds to the other title Villanova won in 1985, when Rollie Massimino, who was on hand Monday night, coaxed a miracle out of his eighth-seeded underdogs for a victory over star-studded Georgetown. Hard to top this one, though. Jenkins, who was adopted by the family of North Carolina guard Nate Britt when his mother moved to take a coaching job, now has a spot with Keith Smart, Lorenzo Charles, Christian Laettner and anyone else who ever made a late game-winner to win a big one in March Madness. Paige finished with 21 and Joel Berry II had 20 for the Heels (33-7), the only No. 1 seed to make the Final Four, who came one agonizing shot short of giving coach Roy Williams his third national title. Not surprisingly, the tears flowed from the 65-year-old coach who, some speculate, could have worked his last game on the sideline; the entire sports program at Chapel Hill is under NCAA scrutiny and awaiting possible penalties for a long-running academic-fraud case. "I'm not very good because I can't take away the hurt," Williams said. "I told them I loved them. I told them I wish I could have helped them more." His thought when he saw the last shot fly: "It was helpless. It was not a good feeling." Even MJ felt the pain. In the stands with the thousands of Carolina Blue-wearing fans, Michael Jordan simply nodded, smiled, looked at his buddy Ahmad Rashad and said, "Good shot, good shot." High praise from the Great One. And what a night for Villanova - a team full of scrappers, grinders and also-rans, who proved you don't have to have a roster full of NBA-bound one-and-doners to win a title. More people in the ESPN bracket contest picked 'Nova to lose in the first round than to win the whole thing. This team flamed out early in the last two tournaments despite big expectations. Before Jenkins did his thing, it was unheralded sophomore Phil Booth - who isn't unheralded on that Villanova squad? - pouring in a career high 20 points to give the Cats their late six-point lead. Booth's forced turnaround jumper with the shot-clock blaring to give 'Nova a 69-64 lead at the 3:03 mark. With 1:52 left, a free throw from Josh Hart pushed the lead to six. But Carolina never quits. Paige sandwiched a 3-pointer and a putback around a bucket from Brice Johnson (14 points, eight rebounds) to help the Tar Heels stay within striking range. Then, he tied the game and the Carolina fans went wild. It looked like overtime. Only, it wasn't. "Every kid dreams about that shot," said Arcidiacono, who finished with 16 points and two assists, one more memorable than the other. "I wanted that shot, but I just had confidence in my teammates, and Kris was able to knock down that shot." 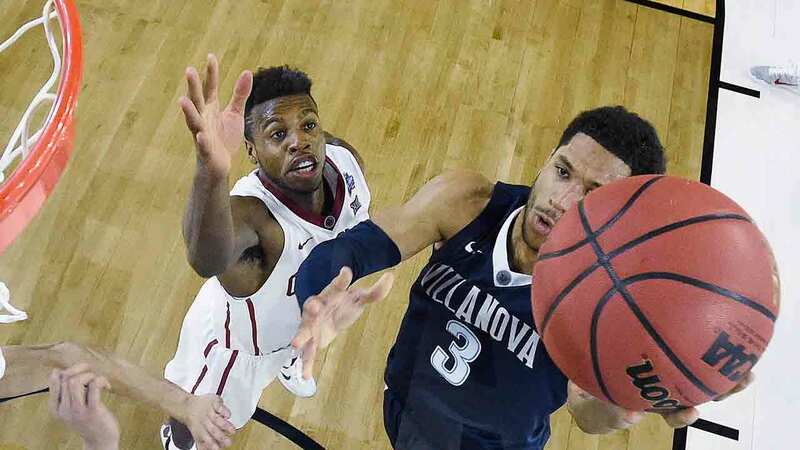 Villanova canceled classes on Tuesday, following the big win.